With the words of Dr Mayadunne ringing in my ears I felt I had to try my best to change my attitude towards my illness. Maybe I was making myself worse? Was it all my fault? Could my attitude really be bringing my health spiralling downwards? I could do this !! Ehlers-Danlos wasn’t going to beat me!! So for the next week I got up every day, I got dressed and I pushed myself to try my hardest. I could do this, I needed some normality in my life, it would be so nice to just get up and not feel dizzy, to be able to drive to the shops and live life as I had done a couple of years ago. With Andrew recuperating from his surgery, it was a perfect time to attempt this positive attitude as he was working less hours so I was able to use his support and also leave the house with him for a couple of hours. It was nice to get out, still using my wheelchair though I wasn’t going to run before I could walk (literally). It wasn’t easy, from day one the symptoms were still knocking me for six but using my management techniques I just persevered. By the middle of the week I was struggling but I kept pushing myself. I was also using my new pedals to try and give me some kind of exercise routine. I was giving this “new me” my all, attitude and body. As we hit Friday we had plans to see some friends for a meal out I was exhausted but was looking forward to seeing them so we didn’t cancel. It wasn’t going to be a late one so we headed off early for a couple of hours, as usual I ate a very small amount and to not irritate my stomach I chose a gluten free, vegetarian option. It was really tasty and I did enjoy it. We got home and I was uncomfortable by the time we arrived, I tried to ignore the griping pain but it kept me awake quite a lot of the night. The next day was Valentine’s, Andrew had a big function, the plan was always for me to tag along just like NYE, you see as a DJ’s wife you either go along on these nights or you don’t see your other half. All day I was unwell, totally in agony, doubled up agony, enough to take more pain relief than normal, the question was all day would I be ok to go along? I really didn’t want to go but I felt I had to, so I just grit my teeth got ready, painted on my smile and off we went. The evening for me dragged, over the course of the night I couldn’t even hydrate as it was so painful. We finally got to bed at 2am once the equipment had been packed away and returned to the shop. 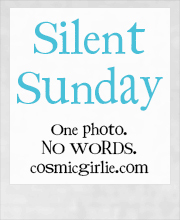 Once Sunday came around that’s when I realised I had crashed, the flare up was here, I had tried too hard. I couldn’t move, I was stuck in bed, was this because I had driven myself too hard or was this because of what I had eaten on Friday which is something I don’t usually eat? I just didn’t know the answer so all I could do was rest and hope this would settle quickly. Over the next few hours my gastric system was all over the place and by Monday morning I made the decision I needed to see a Doctor. I called the GP’s surgery and went along she felt it was probably a reaction to the goats cheese that I had eaten, I was to now put it on my foods to avoid list. She gave me some tablets for nausea and just suggested not eating for a couple of days, giving my digestive system a rest, stick to the Ensure shakes, they would give me the calories I need for now. It really would be a case of waiting until my appointment with Professor Aziz though as I had exhausted the resources at our local hospital. She felt there was nothing more she could do. On Friday with the news whizzing round my head that I wasn’t well enough to complete the Stanmore Rehab program I was truly gutted. Like I said before how was I to get well enough to partake in the program when I was unable to get enough nourishment, yet without the nutrients and calories I don’t have the strength for exercise. It really is a no win situation and I couldn’t see how to get round it. As we went round the shops on Friday we saw some small hand weights, Andrew suggested that it might be an idea to get a set and he would help me devise a self help program to build my own strength. It would really be a case of little and often but i was willing to try anything. He also then suggested that I required get some kind of cycle exercise without getting on a bike or going to a gym. With a bit of research we found a bit of kit that you can use at home which is basically a set of pedals that can be used when you are sitting on a chair or your sofa, or even laying on the floor (ideal for a PoTsie) A few days later I had made both purchases and with trepidation needed to plan how to start my new regime. I checked with some fellow EDSers and PoTsies, they had started slow, suggesting about only about three minutes on the cycle machine once a day and building from there. For the weights it would be between three and five reps per arm, being very careful not to sublax my loose left shoulder. It was suggested to try this twice a day to start and build up from there. My hope is to get some hydrotherapy with my local physio department once I can prove I am trying my best to get out of bed each day, to improve my own fitness. As i had explained at the Stanmore I don’t feel confident enough to go to the local pool, firstly if I have a PoTsie attack it would be highly embarrassing. Secondly if they have to rescue me out of the pool, have they been taught how to handle someone with Ehlers-Danlos Syndrome? I would probably end up coming out of the pool with a popped out shoulder . Which is why hydrotherapy is the best option for me, in my opinion. 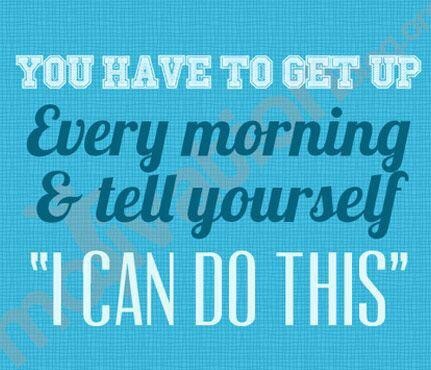 So for now I am trying my best, despite every day feeling rubbish and low, I know I need to get up and get on. I have all the aids supplied and now self purchased to try and improve my mobility. If it doesn’t work then nobody can accuse me of not trying. After the stresses and disappointments of the week, Friday had to be a good day, it was Andrew’s birthday. We had no real plans, usually I organize a get together of friends and family but this year not knowing how he would feel I just felt a quiet birthday would be more appropriate. We had a lovely lazy morning and then Andrew decided he would like to nip out for a coffee, just leave the house for a bit. We nipped to the new local retail park and visited Costa coffee, it was nice to be out, we were both not only enjoying one another’s company but actually enjoying the escape from the four walls. After all it wasn’t a hospital and in the last week if we hadn’t been in a hospital we had been at home, so this was a welcome change. Once we finished we decided to go for a wander, when I say wander that’s me wheeling, round the new shops. After an hour and a few purchases we headed home, we were both tired, just that short amount of time had wiped us out, but it had been lovely. Our plan was to go out for dinner but we were too tired so, Andrew threw together a delicious rice stir fry and we watched a movie. He had enjoyed his birthday and that was the main thing for me. We have a three day rule in our house, you get to celebrate your birthday for up to three days, so on Saturday knowing he wasn’t heading to work, we had another lazy day, Andrew then decided he would like to try the new restaurant down on the retail park, Frankie & Benny’s. Now we have seen people moan about bad service, so went with some trepidation, however really shouldn’t have worried. The table was available within ten minutes, the service was fantastic, the food was served quickly and was great, we had a good night. Yes I did try and eat sold food and I managed as much as possible until pain just got a bit too much. So Andrew got a doggie bag of my leftovers. Finally on Sunday we made some plans to see family and friends for coffee but we wanted to go for a bit of a walk with our cameras again. Get some fresh air and again Andrew wanted to take some exercise. 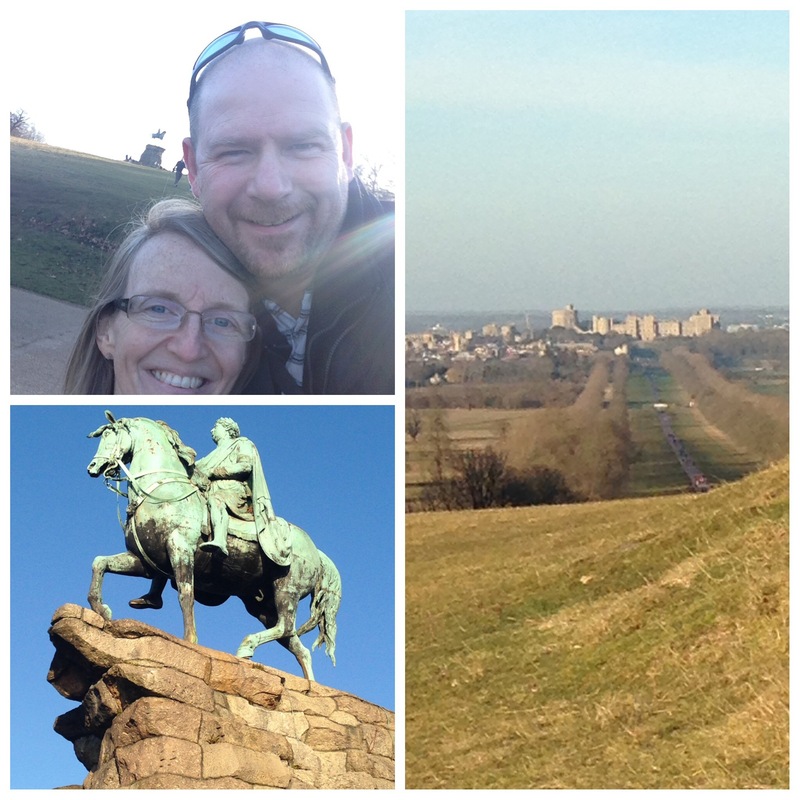 We headed to Windsor and it was a perfect winters day, the sun was glorious, I had wrapped up and although my feet and hands were cold the rest of me was doing ok. We started walking The Long Walk and we didn’t stop, we were chatting and photographing, it was just perfect. However once we got to the Copper Horse, which is three miles away from the Castle, it seemed a little crazy and we both wondered what the hell we had started. The view was stunning and it was truly amazing. By now we realized we weren’t going to make it back to see our friends/family so messages were sent, but we started the walk/push back. The sun was setting and it got colder and colder, it had been such a beautiful day and as the mist settled across the Great Park it looked magical. Once again we had enjoyed another afternoon in a Royal Park for free, you really should try it. We got back to the car three and half hours after we left it, we were both exhausted and cold, so we headed home to get tablets and warm up. We grabbed our daughter and then went out for roast dinner as Andrew had worked hard for it, again I ate a little and was super impressed when they allowed me to have a child’s meal. We headed home in time for a night in front of the TV and had a giggle at Top Gear, and as we cuddled up I told Andrew that despite feeling so low about my health I was feeling good about my life right now. I thanked him for a lovely weekend, it had been his birthday but he’d made it great for me too, that’s how special he is. After a fairly full nights sleep, well it had been the fullest night for two weeks, I woke up feeling a little more refreshed than normal. The plan was to spend the day in bed anyway until my hospital appointment later in the afternoon. So that’s just what we did, we both dozed on and off all day. I managed to get downstairs and prepare Andrew some scrambled eggs on toast, even though that nearly ended in a faint, sometimes you just have to push through, it’s not like he should have been rushing around in the first 24 hours. As it got close to 4pm we decided it was time to get up, washed and ready. Again slow and steady for us both, he’s sore and I’m just wobbly and in pain. I looked at my phone and noticed a missed call with a voicemail. I listened straight away, it was the OT from the Stanmore she wanted me to call back. So before getting ready I rang her back I thought I would find out what she wanted first. She came on the line and I could tell it wasn’t great news, due to my physical condition, weight loss, lack of calorie intake they felt I would be unable to complete the rehab course at this time. She stated as soon as I had seen Professor Aziz and got a decision/help then I could be put forward again. 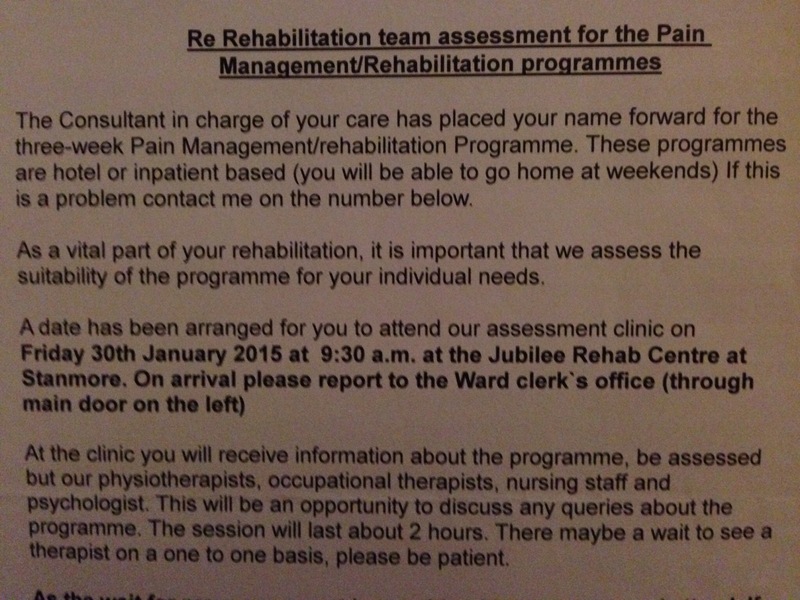 She knew I would be disappointed but even said outpatient physio would be too much for me at the moment. I was devastated, I thanked her for being honest with me, admitted I had been expecting it and said goodbye. As I set the phone down Andrew could just tell, I was upset, I’m so desperate to see improvement but how can I when I can’t gain weight? If I can’t gain weight I can’t exercise, it’s a vicious circle. I got dressed and we headed to my hospital appointment, we had the last one of the day, the Dr was running late, by which time my bad news had sunk in. I was fed up, angry with my lack of ability and frustrated of being left to “rot” because that’s how it feels. 45 minutes after my appointment time we were called in, I don’t think Dr Mayadunne was expecting what he got but he shook our hands and asked how I was doing. I shook my head and said badly, I told him about recent months, the lack of nutrition, causing the PoTs to flare, the HR making the headache worse. About all the additional diagnosis’. He then interrupted and suggested it’s about improving my mindset, I stopped him immediately, I accepted yes that’s easy for you to say but you don’t have this, you don’t live with this, two years ago I had one diagnosis at the top of a letter, now I have ten, yes ten !! That is depressing by anyone’s standards, I haven’t learnt, or been taught to accept that, I haven’t grieved the life I’ve lost, that I miss, and now my opportunity to improve my life has been taken away because of my ill health! How do I get better? I was getting irate by now, he was the Dr after all, he could tell me, how do I improve? His only answer change my mindset! Not how to change it, or who to go to, or what to do, just change it, really helpful. So with the PoTs symptoms still all over the place the plan is to increase the Midodrine to see if we can up my blood pressure, to reduce my PoTs attacks, the only danger is that medication can make my headache worse, so it’s got to be a very slow titration up to 5mgs x 3 daily, I’m currently only on 2.5mgs x 3 daily. He hasn’t suggested any changes to the Ivabradine but that’s a question we can ask via email, he has asked us to keep in touch via email on a regular basis whenever we have a question or need support, which was a good gesture. By the time I left the hospital I was all cried out again, have I got anywhere? Not really no, but I bared my soul to the Dr he hopefully understand how rough a ride this is for me. I’m hating this chronic illness journey, give me anything cureable anyday! I’ve decided I am going to see my GP I have several things to discuss, psychotherapy or CBT, hydrotherapy or physio with an EDS specialist locally, geneticist referral and general support which is lacking at the moment. After the Stanmore assessment Andrew pretty much decided the only way to keep me sane would be to keep me occupied. He wasn’t going to leave me alone at home, at the weekend he took me out shopping and a friend came visiting so that helped. Despite the additional medication my sleep pattern was still very broken and I was really withdrawn and low. As soon as anyone mentioned the surgery I could feel my heart race, I felt faint, so I tried to block it out, which was very hard when Andrew was keeping me by his side ALL the time. Tuesday night arrived and I was sick with worry, now whilst I’m fully aware this is a “simple” surgery, when it involves a carer, my carer it just causes emotions to go haywire. We went to bed not too early as we knew neither of us would sleep too well, in fact I think I was lucky to have got two hours, Andrew slept like a log, I woke him at 6am to tell him he could have his last drink of water. That was it then he didn’t get back off to sleep, we watched the news and cuddled up, I was very quiet, miles away, lost in my thoughts. We left for the hospital at 7am as he needed to be there by 7:30am. We got there in perfect time, parked up and headed to the Short Stay Ward. The welcome was very warm and they showed us to Andrews bed, soon paperwork was being completed and he was booked in. Straight away we were reassured that I was staying with Andrew it wasn’t a problem, that was my first worry out of the way. After a bit of a wait the anaesthetist came to talk about what would happen, all standard stuff really but still nerve wracking. Finally the surgeon arrived he greeted us both and asked Andrew how was the pain and did he feel he had passed the stone. He explained what would happen during the op, I felt nauseous, I asked whether the stent would be absolutely necessary if the stone was as low as it had shown on the second X-ray. He said it may not be necessary but he would see, if Andrew was willing to consent should it be required he would do his best to avoid it. I quite liked his attitude, Andrew explained he ideally needed to go home the same day due to my care, he understood fully, so moved Andrew to the top of the list. We hadn’t been sitting for too long as the surgeon had needed to finish his rounds but once he disappeared the call came, they wanted Andrew. That was it, I went into blind panic, sitting in my wheelchair, my vision went black, my heart rate went crazy. Andrew was led away after giving me the biggest hug and telling me “I Love You” …. I think that’s what started the tears, I bowed my head and wept, I couldn’t stop, after ten days of no sleep and for the next hour or so I was going to be a ball of stress, so I cried it out. I had my back to everyone, no one could see me, so I was being very discreet, after ten minutes, the lady visiting the man opposite came over to me, put her arm around me and just gave me the support I needed right at that moment. Her friend had been through the surgery in December and was going through it again a month later, so she understood my fears. She waited with me until I calmed down and after I thanked her for her kindness she left me for a bit. After a little while she came back and checked up on me, and that’s how it went, she was my guardian angel. Also the nursing staff on the ward, just for a change this ward have the best nurses in the Trust, they knew I was struggling, Andrew had asked them to look after me. They were aware of the wheelchair and they all kept coming by, would I like a hot drink, water, a chat or anything? It made such a change from our Wexham experience. After two hours one of the nurse came to me and said recovery have called and Andrew is ready to come back, the relief was immense. The lady came over and said is that good news? I nodded and yet more tears but this time they were of relief. 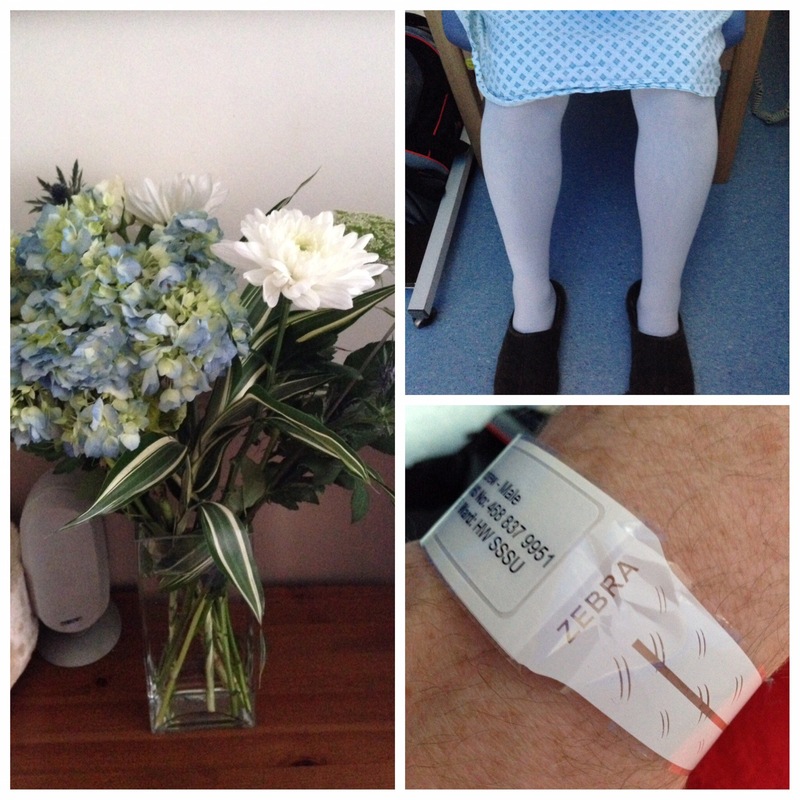 Ten minutes later I heard the trolley arrive onto the ward and sitting up smiling and chatting away was my husband. I couldn’t get close enough to kiss him but I held his hand and wouldn’t let go. They checked his vitals he was good. He just needed to be able to get out of bed, pass urine and then he could go home. This was great news, we assumed we would see the surgeon to find out about the operation too. Finally the surgeon came round he was pleasant and explained what he had seen, good healthy tubes and kidneys! So he said Andrew could get dressed and go. We got organised and the nurse did the discharge paperwork as we loaded my lap with his bag, my handbag and Andrew pushing, once again the lady opposite intervened. Her husband would take us to our car, she would push me and carry our bags, I have never know such kindness from strangers, as we hugged goodbye I said thank you I wouldn’t have got through without her support. She had been amazing, I believed I could do it alone and when it came to it I couldn’t. So now he needs to rest for a week, take it easy and then it’s back to work. Let’s hope he takes the Drs advice about resting! So after such a rotten day I had expected to sleep like a log, I didn’t think I was “worried” about this appointment but the Thursday night I had a worse night than ever. I was awake at 3am, by now it wasn’t just sleeplessness, it was the hot sweats, the palpitations, tears, panic attacks, so by 5am I had given up and got out of bed. I have this personal rule never pick up my mobile, iPad or switch on the TV, try not to stimulate my brain, always try and settle back to sleep, but seeing as I had already been awake over two hours I threw that rule out the window. I picked up the laptop and it kept me going until it was wake up time for Andrew. We had checked the traffic and it seemed to be flowing freely on the M25, so we knew what time to head off. Once on the road, I definitely had butterflies but I wasn’t worried about this appointment, what would be would be. This time the journey seemed much shorter than the first time we had tried to get there. 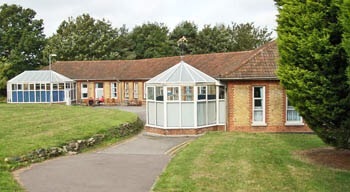 We got to the Jubilee Rehab Centre and were given a lovely warm welcome, with a quick orientation of where the toilets were, both of us were shown through to the conservatory. A few others were already waiting for the session to start, so they took my name and checked me off the list. After a short wait for any stragglers the group session started, this gave an outline on what the rehab course would involve. The physio aspect would be fairly intense, most days there would be group activities as well as one on one sessions for any therapy that they decide you require. The next person to speak was the occupational therapist who explained about how we would be able to learn about pacing ourselves again, getting back to some kind of normality, what ever normal is, to adapt our lives to our ability, rather than be hindered by our disability. Finally the psychologist spoke about helping us get our thoughts out and our heads around our diagnosis. For many of us, myself included, we haven’t learnt how to cope with it. They will try and help us make sense of it. The one thing they admitted they weren’t were a counselling service or psychiatrists. The rehabilitation course is either based within the hospital or at a nearby hotel, only the rehab team would decide which venue I would be suited to. I would have no influence on their decision, during the one to one which was to follow, they would ask questions and at that time would be my opportunity to convince them how well I could cope. The group session ended and the small group slowly started chatting amongst themselves, it’s strange when you all realise how many symptoms you all have that are the same. Finally we all started getting called through one by one, I was second to be taken through. We met with a lovely OT called Amanda who immediately put me at ease, we started going through the form I had filled out back in October and she made additional notes. Of course there were more symptoms and referrals to be added, as I had got sicker since October, so she took the information. I explained about my hospital stay in December and waiting to see Professor Aziz. She asked about my day to day routines, again explaining how it takes so many days to save up “spoons” to enjoy a day out and then it wipes me out for another few days. 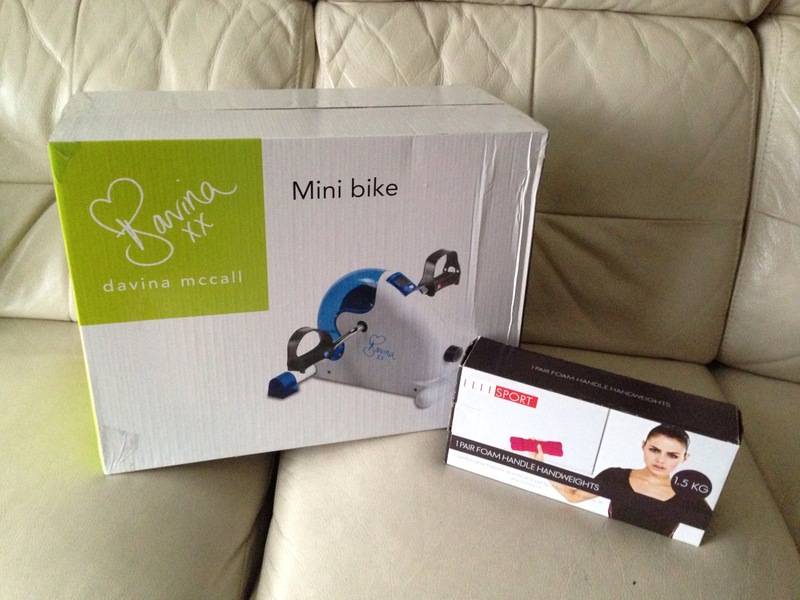 I knew her concerns instantly how would I cope with three weeks of physical exercise? I said honestly at the moment, I wouldn’t. In three months, if I can get some weight on, and improve my abilities maybe a bit better. She asked had I been offered any physio or hydrotherapy? No I hadn’t been offered anything! Her suggestion was that I would be given some outpatient support in the next few weeks and months to improve my abilities. As we then talked about my diagnosis and what I used to do before all this, she could tell how upset and angry I was, she then also suggested that if at all possible it might be an idea for the psychotherapy team to support me in outpatients as well. This way we would be making good headroom before I start the course. I felt it was all a good step forward. As we left I knew I wouldn’t be offered a course immediately but hopefully within the next six months, once we get all the other physio and offers in place. All in all it was a successful appointment and as we left the Stanmore I felt hopeful that we had set goals that would be achievable as soon as I got their valuable support.